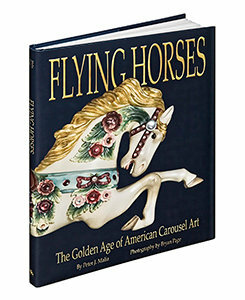 Flying Horses is a quintessential American story about immigrant craftsmanship and entrepreneurialism told in chronological order decade-by-decade that examines the evolution of the artistry of carousels from the post-Civil War era right up to the Great Depression. Renowned studio, corporate and architectural photographer Bryan Page includes more than 175 crystal-clear color images of works by all of the master carvers and carousel carving styles, drawn from the extensive collections of The New England Carousel Museum. The stunning photographs are exquisitely printed in 4-color making the book not only historically relevant and a master study, but also a work of art. The book contains luxurious spreads of beautifully rendered images of the wooden horses with details of the carver, style, dimensions and pertinent historic dates. Bryan has managed to capture the beauty and detail of the carving of the carousel horses that reveal the meticulous nature of master carvers on a quest toward perfection. Copyright © 2016, Page Photography LLC. All Rights Reserved.